Julian Bailey is one of this country’s foremost figurative painters. His new paintings represent the culmination of thirty years work, searching for and exploring a painter’s language that is both true to himself and appropriate for our time. Instantly recognisable for his eloquent, seemingly effortless brushstrokes, Julian’s work has grown up with him through a process of hard work and a kind of relentless daring. Invited to preview the exhibition at his studio, I find myself in a delightful gravel courtyard surrounded by geraniums in terracotta pots with doves, chickens and ducks roaming free. Julian appears dressed in an old guernsey and fisherman’s cap and leads the way into a sunlit room where thirty or forty canvases thickly painted in compelling colours are lined out on shelves. After he left the Royal Academy he continued to enjoy the student life in London, painting the Portobello Market, staying out late with friends drawing people in jazz clubs and cafes. 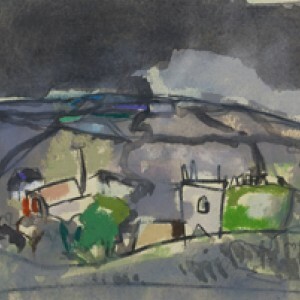 He was taken on by the New Grafton Gallery in Barnes where he showed foreboding paintings with stark lighting and black outlines reminiscent of Josef Herman and David Bomberg. By this time Julian had met and married the potter Sophie Cullen. In 1994, they took a flat for six months in Bath. The studio had a lovely view over the river and there Julian had a break-through moment. The black outlines disappeared. His palette lightened up and he realised he could draw colour against colour in paint on a board. He had found his painting style. Shortly afterwards Julian was taken on by Browse & Darby. As a teenager Julian’s father used to take him there to look at the work of Gwen John, Sickert and Degas. When William Darby agreed to take five of Julian’s pictures, “I was incredibly excited.” Julian has since had five solo shows there. He paints every working day to a disciplined schedule and finds it really tiring. “It’s demanding, always looking to find freshness and clarity, like an electrical charge.” He does layer after layer of painting and scraping off, each time upping the ante to come closer to what he wants. “It all has to come together at the same time or it all has to unravel. I’m trying to paint form, in space, in good colour all at once.” As it is his brushstrokes are deliciously economical conveying the weight of rock, the lilt of a boat, the poise of a figure. “I’m not stroking the surface,” he says with a smile. How does he decide what to include? “I take the point where I am sitting and I draw the line to where I want to be. Draw that first on a clean sheet of paper. Choose your journey. Follow the white tracks scored into the green landscape. Make it a searching line. It might follow a hedge winding up a hill or go over a rooftop, as long as it leads your eye. Everything else in the picture then has to compliment that line.” I can’t help feeling that Julian’s own journey will always follow a searching line.